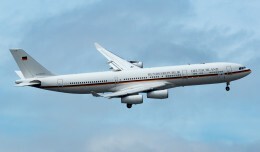 So you may be asking yourself why is a 16 year old airline debuting a retrojet? Well this is JetBlue where out of the box thinking is the norm. 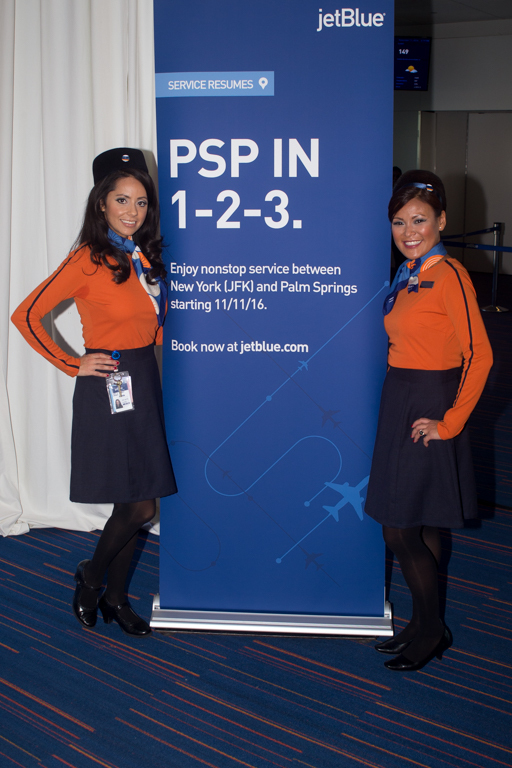 With JetBlue restarting their seasonal Palm Springs service, the airline set out to try something new by bringing back something old. And with that their 1960’s era retrojet was born. The Jetblue design team was tasked with coming up with a scheme and branding on what Jetblue would have looked liked some 50 years ago. 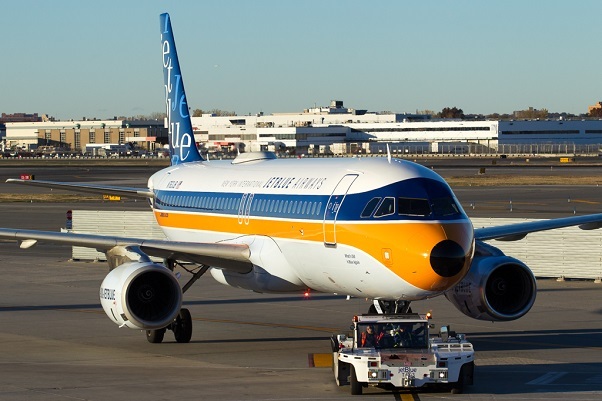 The Retrojet named “What’s Old is Blue Again” made its official debut last Friday afternoon on the New York-Palm Springs route. JetBlue designers did some deep research into 1960’s styles and themes to come up with a retro look that was original yet fitting for that ear. The team took design cues from a number of airlines,including TWA and Eastern for the retrojet. 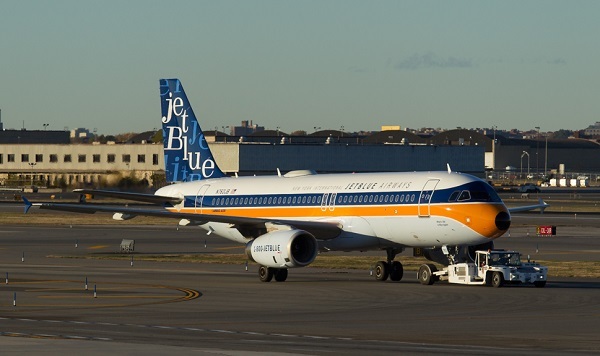 The color scheme includes blue and orange cheatlines, and a tail with a jazz-inspired arrangement of letters spelling out JetBlue. 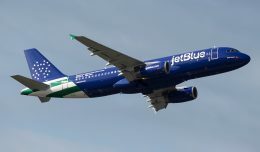 No detail was too minor, as the scheme includes the airline name spelled out in full (JetBlue Airways) as was common at the time, and the usual “jetblue.com” titles on the engines is replaced with the 1-800-JETBLUE phone number. If you’re going to have a retrojet then its only appropriate that you have retro flight attendants and JetBlue did just that. Flight attendants on the inaugural flight wore retro style uniforms to enhance the 60’s feel. The airline also opened up a pop-up travel agency in Soho over the weekend which could have doubled for a scene from Mad Men as it too was decked out full 1960’s style and decor. Some have suggested that this retro “style” flight be a more permanent experience, but unfortunately it’s only a one time event. 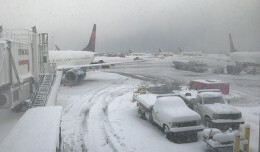 Jetblue’s Terminal 5 sits adjacent to the iconic TWA Flight Center and the airline honored the former tenants by adding a little red to the Jet “Blue” festivities. Former TWA flight attendants in their original uniforms some dating back to the early 50’s were on hand to participate in a retro fashion show prior to the departure of the inaugural flight. 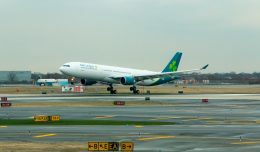 N783JB, “What’s Old is Blue Again”, get’s towed to the gate. 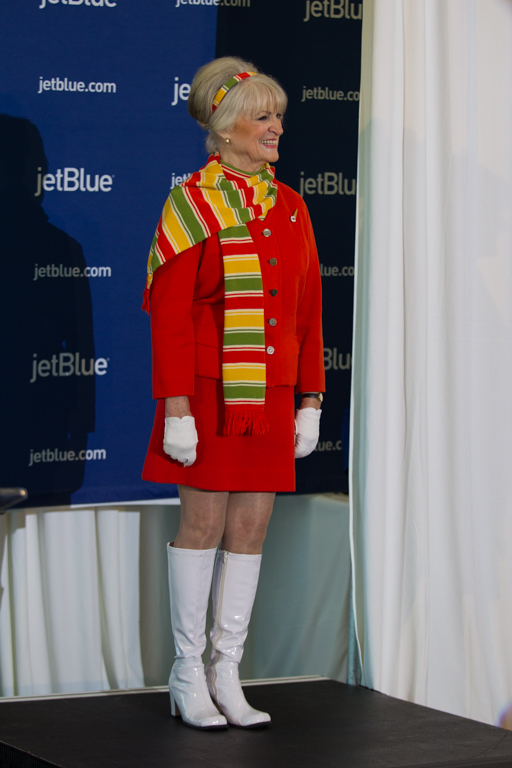 JetBlue unveiled retro uniforms for the inaugural flight to Palm Springs as well. As part of the retro theme, former TWA flight attendants were on hand to model the uniforms they wore in the 1960’s. 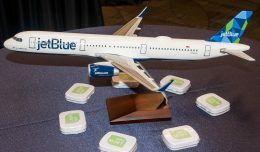 On Monday morning, JetBlue Airways unveiled their newest aircraft to wear a special livery. Blue Finest honors the NYPD.